Hey there! Thanks for dropping by Ashford Daniel Writes! Take a look around and grab the RSS feed to stay updated. See you around! Please note: It’s now 30 Years. Today marks exactly twenty-five (25) years since Vincentians at home and abroad were plunged into their most horrifically tragic air disaster in the history of commercial air flight in St Vincent and the Grenadines. It was on August 3, 1986, that LIAT flight 319 disappeared while attempting to land at the Arnos Vale airport (now renamed The ET Joshua Airport). While all incidents that result in loss of lives are tragic, the untimely deaths of the thirteen souls on board were particularly stinging to all sections of the Vincentian society. That single flight not only combined a unique mix of some of the most progressive nation builders in our country at the time, but also brought grief to our regional and international territorial relatives. Quite possibly the first face that comes to the minds of those of us who were around twenty-five years ago and now recall that stormy Sunday night, is that of Donna Young. Donna epitomized the youthful beauty, charm, female empowerment and potential of St Vincent and the Grenadines. Donna was a bank worker, employed with Barclay’s bank. She had just turned age twenty and was coming back from a holiday trip to America. 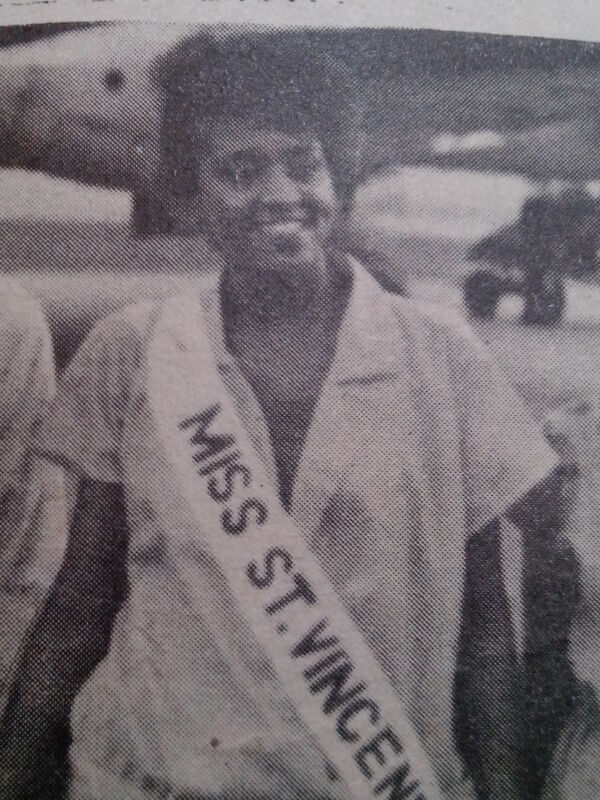 Donna had won the Miss SVG and Miss Carival shows right here at home in St Vincent in the year 1984. 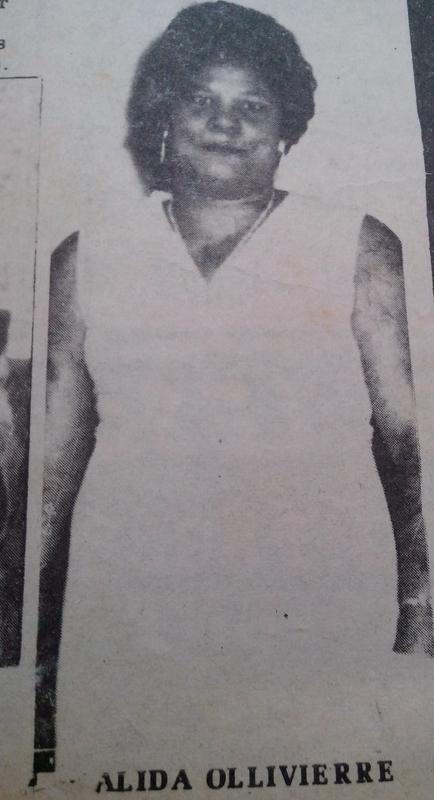 Donna Young also held the Miss OECS title as well. Her smile lit up the stage like no other. One could not help but love Donna Young. To fully appreciate the connection that the Vincentian public had with Donna Young, think of her as the late Princess Diana of the UK or of President John F. Kennedy (JFK) of the United States of America.. Indeed, Donna was our own Vincentian Princess. She was royal. Also on that ill-fated flight was a watchmaker who was physically challenged. Imagine a gentleman in his wheel chair and is out and about daily taking orders and repairing watches. That was the fortitude of Robert Fraser, who was born with no legs. Disability was never going to be his inability! 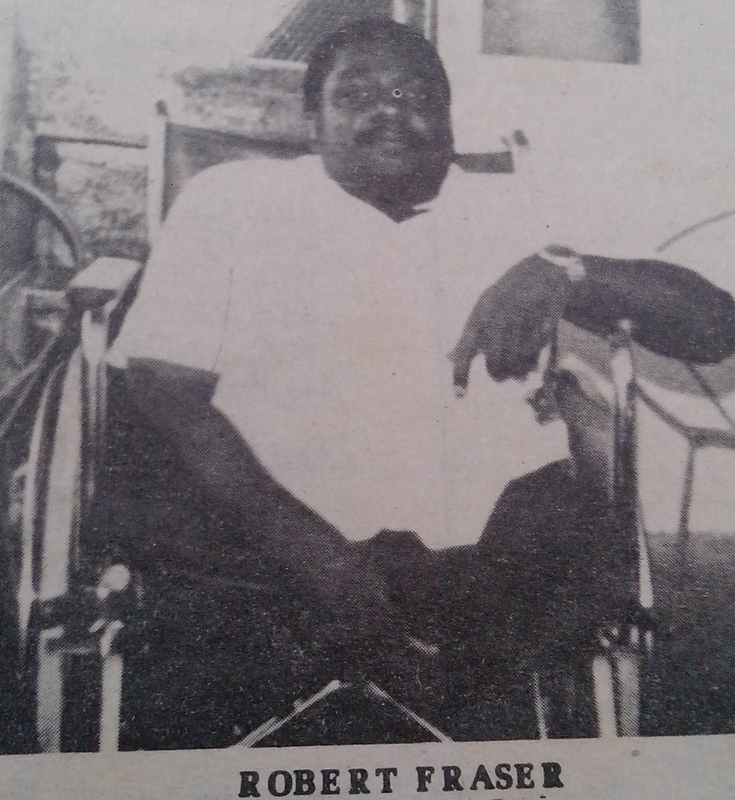 Robert Fraser was on the flight, coming back home from a seminar in St Lucia that focused on persons like himself who could not walk or had other physical challenges. Then there was a family of husband, wife and eight-year-old son who perished that August night. Again, it is expected that everybody’s death will be mourned, but, alas, this was not the average Vincentian family. At just seven years into its political independence from Great Britain, St Vincent and the Grenadines was unfortunate to lose its political opposition leader and two members of his family. Hudson Tannis, along with his wife and son, Ordway, were returning from a wedding in St Lucia and happened to be aboard flight 319. 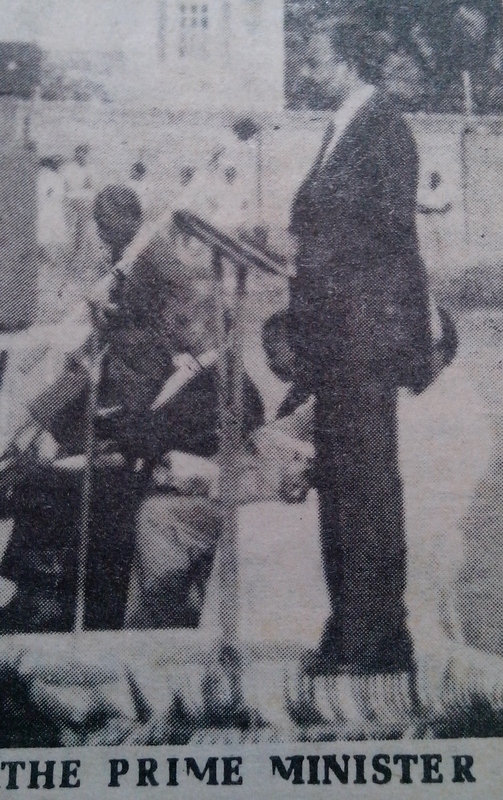 Hudson Tannis was also the former Deputy Prime Minister of St Vincent and the Grenadines during the Labour Party government of Milton Cato. The Grenadines also felt the loss of lives because a native of Bequia, a female passenger listed as Alida Ollivierre, was returning home for her friend’s wedding. She was actually traveling on flight 319 with the bridegroom, Rufus Nelson, a Dominican. Other passengers on the doomed flight included Busta Lockhart, a Vincentian who was on his way back from cutting cane in Canada. Another Vincentian passenger on board was Ruth Babb. The remaining passengers were two Italians. So, of the thirteen persons on the plane, eight of them were Vincentians. The aircraft was being piloted by two pilots, Phillip Roach of Guyana and Keith Hobbins of Jamaica. It has been said that the pilot captaining the flight, although he had been to SVG before, was now doing so as the pilot in command. Apparently, he had an idea where the runway was. Unfortunately, owing to the mountainous terrain of the country, the airport is right next to the Caribbean Sea. Because of the rainfall that night, the place was foggy. Visibility would have been extremely poor. Later, residents of Cane Garden will say that they heard the aircraft circling and then the sound of a sputtering engine. Liat flight 319 aborted the first landing attempt. It was during the second landing attempt that the plane disappeared. For days and weeks after, all able-bodied man, woman and child, took to the sea and shore to do what they could to find any signs of remains. Apart from a sighting of some floating oil, the remnants of that plane was never to be seen again. At least up to this day. It is said that the waters in the Grenadines are among some of the deepest in the hemisphere, measuring between 180 to 1000 feet. Along with our local coast guard, there were other coast guard ships from Caribbean countries such as Barbados, Trinidad and Tobago, Venezeula, and Barbados. In addition to all those boat searches, The Trinidad and Tobago government sent a helicopter, and the USA sent an aeroplane to participate in an aerial search and rescue effort. The following weekend one of the largest and most sombre memorial services was held at the Victoria Park, where everybody who is anybody in St Vincent turned out to sympathize with a grieving nation. Saturday August 9, 1986, and Sunday August 10, were declared official days of mourning and flags were flown at half mast across the country. This is the last recorded air mishap that LIAT has had which had a direct impact on Vincentians. I hope that our younger generation will at least take a moment today and pause in reflection of the wealth of human and Vincentian potential that we all lost that night. One cannot help but feel that somehow our lives in St Vincent would have been that much richer as a result of the contributions made by the “unlucky 13” of LIAT flight 319, back on August 3, 1986. May their souls enjoy eternal bliss. yesterday I was just telling my daughter about this flight, she thought I was just talking random…she went and look it up…this will 4ever b in my memory….was at high school when this happened…. It will also be in my memory for life. I was a young child at the time and I still remember how all of us were so safe at home sharing jokes and laughing as the rain was falling outside; little did we know that at the same time these passengers were dying a terrifying death. Thanks for your empathy and kind regards, Shorn. Thanks so much for sharing…. I wasn’t born when this incident took place and I’m saddened by the loss of life. Sad to hear…what happened to the worker? My family and I (from T&T) were actually in the Arnos Vale airport that night waiting on flight 319 to take us on to Grenada as part of our summer vacation. I remember being a little boy at the time and wondering what was causing such a long delay with the flight. I remember the storm and seeing lights approaching the runway at one point (thinking we might finally be leaving soon) but then – no plane. I remember also trying to figure out what all the fuss was about later on when it was obvious that something was wrong, as well as the next day when there seemed to be a lot of commotion around with all the search and rescue efforts taking place. Though I’ve always been thankful to God for spared life that night, my heart goes out to the families of those who didn’t make it. Thanks to the author of this article for bringing their stories to life by sharing this information. It’s the first exposure I’ve had to some of these details, and as someone who lived another side of the experience I’m very thankful for the clarity it brought. Kerron, thank you for contributing your own very special memories. It’s an honour to hear from someone who was actually on the scene at the airport on that fateful night. God did indeed grant you life’s mercies by sparing your life. Did Hudson Tannis’ wife have a name or identity besides being his wife? He has a name and identity, their son has a name and identity, but the woman is just “his wife.” So disrespectful. After 25 years the other passengers have not been identified? One could assume so from reading this article. They have nationalities, but no names? “Two Italians.” Shoddy piece of writing. May they all rest in peace. 1. Even before your critique has been made public, another reader has stated the name of “his wife”. I’m certain you have or will read the relevant commentator section to find that information. 2. From what I see in my admin panel I thank you that, although you rated the article as “shoddy” and poorly written, you have inexplicably become a subscriber to my blog. That means you want to be among the first of my expanding readership to know when I post a new blog entry. As they say, action speaks louder than words; hence, I conclude that my writing has met your acceptable standard of quality expressions worthy of your approval. This is a day I will never forget. The Dominican, Rufus Nelson, was my first cousin and on that day the family lost one of its best. Trevor, as we called him, was the first son of his mother and her pain is evident today. Ms Alida was my mom’s best friend and I had the opportunity to spend time with her; she was an awesome woman. Twenty nine years and the pain continues. To all the loved ones left behind, I pray for your continued strength. Adele, I extend my sincere sorrow to you and your dearly departed cousin Rufus “Trevor” Nelson’s family. I can only imagine just how devastated the death of her first born must have left his beloved mother. Nonetheless, I thank you for telling my readers more about the Bequiarian and Dominican who were onboard Liat flight 319. Thanks for the info. However, there was no info on any flight attendants on board the flight. This kind of aircraft was a twin otter which was a nineteen seater, and did not carry a flight attendant. Well I was 13 years but I remember it like it was yesterday. I knew Mr Fraser at Prospect/Brighton. Sadly, Christine Tannis was an extremely close friend of my Great Aunt Eileen Radix RIP who I was living with at the time. I remember Christine and Ordway visited us on the Thursday, I think it was, saying that they were going to a wedding in St.Lucia. Ordway and I were fooling around with the piano throughout their visit and I remember when they were leaving she said ‘see you next week’. And how can I ever forget my sweetest and most beatiful cousin Donna. I miss her soòo much. I felt so fortunate to be her cousin. I know Aunty Heidre’s heart was crushed but the support from all around near and far kept her going. Donna’s smile was permanently fixed and those dimples! I have never seen dimples as deep as hers again. She was a true Queen to me and I will forever love her. Her life may have been short but she left us with memories for a lifetime. It is so very helpful to hear from someone who knew some of the passengers personally. Thank you for giving us the name of Mr. Tannis’ wife as well. In 1986 when this tragedy happened I was around Ordway’s age and I often wondered how frightening it must be for a young boy to die like that. But at least he had his parents with him. Yes, the Tannis family was returning from a wedding in St Lucia. I’m also comforted by your fond memories of your cousin, Donna Young. Indeed, there was a special charm and welcoming charisma about her smile. I’m glad you did enjoy your time around these almost forgotten people aboard Liat flight 319. Although I never met any of the persons who were onboard that doomed flight, I wrote this blog post as my own tribute so as to do what I can to help keep their memories alive. Thanks for sharing all this interesting information concerning LIAT flight 319. As a Caribbean National over 40 years old I have never heard of this tragedy. Having read this article I am asking myself the question why did I never hear about this, why has LIAT not seek to remember the victims even on the anniversaries that have passed. Thanks for keeping their memories alive. I appreciate your sincere gratitude. You also ask two great questions. It is my hope that this blog post will be one such means of keeping the memories of those who perished in that long gone tragedy alive among the living generations now and forever. I too am a Caribbean national…St Lucian… and I’ve never heard of this terrible tragedy! How peculiar and sad! Thanks for sharing. You’re quite welcome. Keep their memories alive. Interesting article. RIP to those who perished and may relaives of the deceased find inner peace and comfort. Thank you for keeping their memories and history alive. Glad to be able to keep their memory alive. may they soul rest in peace. This is very heart touching when i read this article, moment of silent to show our compassion and acknowledgement for the passengers of LIAT flight 319. My cousin Andrew Babb wife Ruth Babb were on that flight…(you spelled her surname Wrong). We the relatives were saddened deeply by her loss as she was a gentle, loving, wonderful aunty to each of us younger children around…Many a summer vacations were spent at their home where she showered us with laughter and love..Let us never forget..
First of all let me apologize to you and all your relatives for the misspelling of your aunt’s surname. I have made the necessary changes in the article. Secondly, I extend my condolences to you and your family on the disappearance of your aunt. Thirdly, I thank you for sharing such precious memories with my readers. I am certain your aunt must have made your childhood summers very unforgettable and a paradise experience. I heard about this briefly but not in as much detail as this story. Thank you for bringing it to light for me and many others I’m sure. May these souls rest in perfect peace. I don’t forget this horrific day. Donna Young was my dear friend as we did two pageants together Antigua and Dominica. I talk about her all the time; she is sooo missed and I loved her dearly. R.I.P my sweet friend, and the others who perished on that flight. I have heard about this unfortunate tragedy but only as ” there was only one LIAT flight that ever crashed”. You have brought life and added meaning to the loss of those lives in a way that is greatly appreciated. The mere writing of the story has stirred the memories of those who were intimately involved with those on board and added to the richness of this tale. Thank you for sharing!! I have always heard about the ‘one’ LIAT Flight which crashed years ago and I also heard about this tragedy but never connected the two. I came across this article by accident and the emotion and hurt I’m reading in the words of loved ones and friends has my hairs on end. I am not Vincentian but I truly feel the pain and deeply sympathize with all who lost their loved ones on that dreadful night. It was truly a touching article and the story should truly be kept alive. I read the comment about LIAT not honoring or even acknowledging the memory of those who lost their lives and I fully agree that they should. Though I understand that maybe the company doesn’t want to cast a shadow over its operation it should be truly fitting that at least on the 30th anniversary of that tragedy some form of remembrance should have been made. Thanks so very much, Samantha, for adding your thoughts and comments. The watch repairer was not coming from vacation …. but from a disable conference and he put off his flight from the day before because he was asked to preach the Sunday, which he accepted. He knew Christ. He was a Christian. That was the reason he was on that flight. He was in St Lucia at my invitation. We were trying to form a regional association for the disabled. I then was over for the service at the Victoria Park and broke down. It still saddens me. May their souls REST IN PEACE. My dear Elizabeth, thank you so very much for shedding light on the reasons Robert Fraser was aboard Liat flight 319. I’m confident that he is at home with the Lord. It would have been interesting to learn what his final sermon was about on that very last morning of his life. I was a young girl when this happen,my aunt Ruth Babb was on that flight,she was flying back home from St Lucia,this hit my mom hard because both of them was very close, continue to RIP Aunty, thanks for sharing. 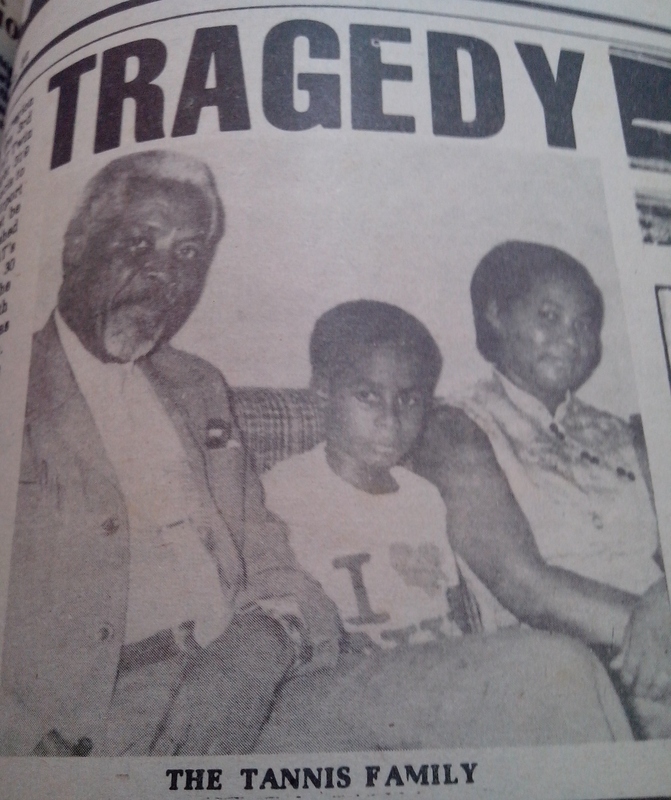 I was commenting on the tragic flight that occurred on my island Dominica in 1998 when someone mentioned this tragedy. It’s so sad reading about loss of life especially those of young persons. My sincere condolences to the family and friends of those that lost their lives, may they continue to rest in peace. Thinking of those that lost their lives, 31 years ago today. I pray their souls are at peace with the Lord. Can the Caribbean Survive Intense Hurricane Seasons in the Future?